NOTE: -Do not hold the shift solenoid valve connector to remove and to install the shift solenoid valves. Hold the shift solenoid valve b o d y . -Do not install the shift solenoid valve A before installing the shift solenoid valve D, and do not Install shift solenoid valve B before shift solenoid valve E. If shift solenoid valves A and B are installed before shift solenoid valves D and E, it may damage the hydraulic control system. 1. Remove the shift solenoid valve mounting bolt, then remove the shift solenoid valves by holding the solenoid valve body. 2. 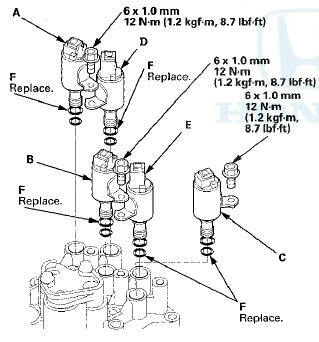 Install new O-rings (two O-rings per shift solenoid valve) (F) on the shift solenoid valves. NOTE: A new solenoid valve comes with new O-rings. -If you install a new solenoid valve, use the O-rings provided with It. 3. Install shift solenoid valve D by holding the shift solenoid valve body; be sure that the mounting bracket contacts the servo body. 4. install shift solenoid valve A by holding the shift solenoid valve body; be sure that the mounting bracket contacts the bracket on shift solenoid valve D.
5. Install shift solenoid valve E by holding the shift solenoid valve body; be sure that the mounting bracket contacts the servo body. 6. Install shift solenoid valve B by holding the shift solenoid valve body; be sure that the mounting bracket contacts the bracket on shift solenoid valve E.
7. Install shift solenoid valve C by holding the shiftsolenoid valve body; be sure that the mounting bracket contacts the servo body. 8. Install the shift solenoid valve mounting bolts.